This blog is part of a larger “What-If-We’re-Wrong-a-Thon” by several EMS bloggers where we attempt to view the opposite point of view on a topic we have previously taken a stand on. You can find the other articles here. This weekend I had the opportunity to attend the Connecticut State EMS Conference (more on that in another post). One of the sessions was about professionalism by Dr. David Powers. Honestly, I wasn’t sure how much more there was to say on the topic, it seems pretty straight forward. However, after attending I came away wondering is there such a thing as being too professional? Google defines professionalism as: the competence or skill expected of a professional; the practicing of an activity, especially a sport, by professional rather than amateur players. This leaves quite a wide berth for perception of what is professional in terms of being an EMS provider. Please note it does not say “volunteer” or “paid”, but rather “professional” or “amateur”. I think we can all imagine some folks on both sides regardless of their compensation status. Now that we have laid a foundation to be able to assess what it means at a base level to be a professional, how can individuals in various roles perceive professionalism differently? Is your Chief’s perception of what it means to be professional different from yours? What do our patients think a professional looks like? 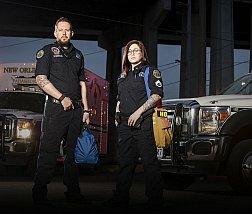 The cast from Nightwatch was one of the examples brought up in the lecture I attended, specifically about some of the cast members visible tattoos. In the past visible tattoos have been a hot button depending on your location and agency. Some providers were required to cover visible tattoos or wear long sleeves all year to keep them hidden. However, tattoos are now readily accepted in most of society and they could be used as a tool to related to certain patients. To be sure, all patients are different, and some may take offense, particularly if the art in question is garish or overtly sexual, though that doesn’t seem to be common. Do they look professional to you? They look clean, their uniforms are neat and shirts are tucked in, pants held up with a belt, the tattoos are noticeable, but not the first thing you notice. If their community members and agency accepts it, they look like good providers to me (note we didn’t even discuss their clinical skills yet… perception is everything). 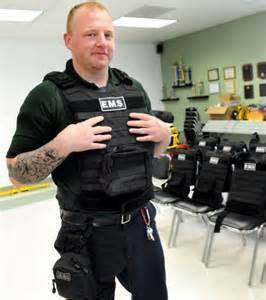 EMS Provider or Police Officer? Could we look neat, clean, and in uniform, but be perceived by patients and family as “professionals” other than EMS providers? In the appropriate circumstance this uniform is appropriate and necessary for personal safety, but what about everyday use? If you were not involved in our service would you know if the man above was an EMT or paramedic or a police officer? Could looking militaristic be averse to excellent patient care? Could our uniforms cause more anxiety for patients and exacerbate their already compromised health? 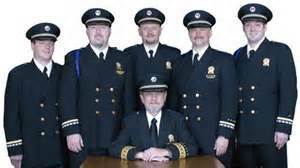 Could a uniform like this lead to safety and security issues for crews while they are on duty due to mistaken identity or intent? Another part of the conversation in class was looking “too” professional. Funerals and special events do require an extra degree of attention to your uniform, but on a daily basis is your uniform so perfect you look like you didn’t work at work? If you are a white shirt, could your subordinates feel distanced from you because they feel you don’t relate to the “workers” and forgot what the “street” is like? Of course, this is not an excuse to roll out of bed and into the ambulance looking rumpled and bedraggled, but could looking too perfect be intimidating; like the proverbial beautiful woman who can’t get a date because men feel she is unapproachable? While we shouldn’t throw away the idea of becoming professionals and being at the top of our game, particularly in our industry where life and safety are at the top or our responsibilities, we should take a step back and imagine the situation and perception that may be applied when we arrive on scene. Being presentable and clean are still important, but is a creased patch an absolute requirement to do the best CPR or be kind to a scared patient? Perhaps, less starch could be used in application to the topic of uniforms and appearance by staunch advocates, such as myself, when reviewing everyday EMS scenarios.